1. Make the kids happy. 2. Make the parents, grandparents, friends and relatives happy. 3. Have fun at what we do. 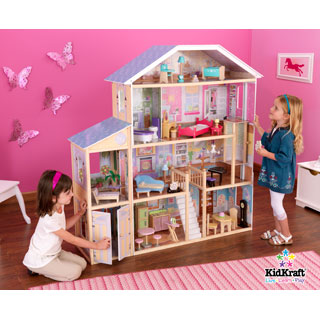 Toys are categorized by type and age appropriateness making it super easy to find the perfect gift. Do you know a little one that is turning two soon? You can check out Toys 2 year olds love! Maybe your looking for a gift for a special girl that loves to craft. They have some great Craft bead kits. They also have the Best wooden toys! I love the wooden Melissa and Doug play food sets they carry and have actually purchased a couple for my little girl in the past. I have also purchased art supplies for Penelope from eBeanstalk and I have always been happy with my purchases. In fact I have the site bookmarked on my computer, it is my go to site for kids toys. Lately I have had my eye on a few things I would love to get for my daughter. 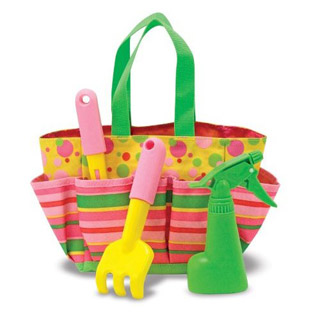 She has started showing interest in gardening and watering the plants around the house so I think she would love this Blossom Bright Tote Set. 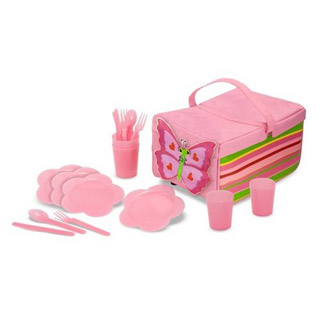 The weather has been really nice here and Penelope is always asking to go on a picnic so I know she would adore this Bella Butterfly Picnic Basket. I have also had my eye on this Majestic Mansion! Penelope is always wanting to "talk" this is what she calls pretend play and she is always handing me one of her dolls so that we can pretend different scenarios. I just know this dollhouse would make the perfect "talking" place and would bring years of fun. It's a little high in price but Christmas is still a few months away so maybe I can start putting money aside to save up for this present. I could go on and on telling you all the things Penelope would enjoy from eBeanstalk. Check them out for yourself and you will see what I mean. eBeanstalk offers free shipping on all orders over $75 and if your a grandparent they even offer special discounts just for you! I am signed up to receive their newsletter which contains the latest news on any promotions or deals they have going on as well as advice and suggestions on toys and gifts. This is definitely the place to shop for the kiddos in your life! Although I will be receiving a promotional code from eBeanstalk for writing this post. All opinions expressed in this review are my own and not influenced in any way by anyone.